If You Weren’t Feeling Old Enough: It’s official. We have our first great-grandparent in the class! Jim Dill claimed that honor when Dante, Class of 2040, touched down on terra firma on 18 July. Congratulations, great-grandpa Jim! Retirements: Scott Smith retired in May from Delta Air Lines, leaving as a B767 Captain based in Detroit, but still living in the DC area where he retired from the AF in 1996. Scott reports he’s still married to his “first and only love, Janet,” and they’ve been married since 6 June 1975 so there’s a chance it might work out. The Smiths recently met up with former roommate Stan “Chumley” Collins and his wife, Mary, in a pub in Cork, Ireland, and spent the evening eating and swapping stories. If it was like most classmate reunions, Scott and Chumley swapped the stories while Janet and Mary rolled their eyes. Mike Banker put in 30 years with Northwest/Delta before retiring in June as a B767 Captain based in Seattle. His account of his life after retirement is that he hasn’t done much of anything except keep the house and garden going since his wife, Joanie, is still working. They’ve been married 43 years and somewhere along the way wound up with 5 kids and 12 grandkids who keep them from sitting down and getting comfortable for any appreciable stretch of time. Mini-Reunions: Larry “Frankie” and Michelle Fariss hosted a brunch on 9 Sep at their house in Colorado Springs for fellow classmates Tom “Houner” Calhoun and Ben Phillips, who were in town for an 18 TFW reunion. Joe Dowdy showed up for the brunch because he heard there was food in the area. For the record, Frankie wasn’t assigned to the 18 TFW, he just likes to hang around Eagle drivers in a hopeless effort to interject some class and humility into their lives. Rapping at his chamber door. Of snippets he could cut and paste. The tapping he feared was his doom. Of ticking time, and nothing more. Like clouds of angst and even dread. And all he heard from was Bill Murray? Then leaned upon a gnarled cane. It called his heed, and nothing more. Taking it on the Road: Jim “Tony” Mahoney has found the way to a happy retirement is to never stop moving. Since his retirement 11 months ago he and Cindy have been on four cruises and five long road trips. The road trips were necessary to stretch the legs on the Tesla Model 3 they picked up at the end of March. With the Mahoney children spread out in Maine, Ohio, Phoenix and (maybe) Denver, and parents in Nebraska and Texas, Tony and Cindy will undoubtedly have plenty of opportunities to test the range on the Tesla. John “Sax” Saxman wins the retirement traveling award for this quarter. Sax and his wife, Sherri, spent 115 days doing the “Down East Loop” on their 42-foot Grand Banks trawler. This was apparently a piece of cake for the seasoned waterway travelers since they did the much longer “America’s Great Loop” in 2015. Google has details on both of the loops. In Sax’s own words, they enjoyed “beautiful scenery, great people, abundant wildlife and sea life, and lots of adventures.” Sounds more enjoyable than driving a tractor in Alabama, eh? 1. Joe Carroll, Rod Kallman, & Dale Hanner plus two friends roughing it. 2. Rick Layman, Stan Collins, & Stan Siefke celebrating...something. 3. Bill Ashcraft, Tom Barbera, Bill Davis, K.C. Schwarz, and Greg Berlan temporarily unsupervised in Hawaii. From Bruce Mitchell: The minutes for the October CAS meeting are HERE. If you need assistance with AOG questions or comments, please let me know. Biennial CAS election of officers just concluded; I will be serving another two years on the CAS Executive Committee. If Mark Volcheff is elected to the AOG board in February, we'll need a new CAS back-up to replace Mark. Please let me and Jim Carlson know if you are interested in serving in this way. 2019 AOG Election: There is an informative video on Youtube (USAFA AOG Election Information) of the AOG Board President Cathy McClain '82, discussing the upcoming February 2019 AOG election. Mark Volcheff is running for an elected position on the AOG board. 1. You must be a member to vote in periodic elections. 2. At least 25% of membership must vote for by-law changes to make the results valid. The whole graduate community did not muster 25% participation overall in the last election. Even though '75 was in the top tier of classes participating in the past AOG election, we can still do much better. Please consider, "Do we as graduates really want to cede our voice for the control of our alumni association back to a small group of people?" That is effectively what we are doing if we can't collectively support an election with better than 25% interest. 3. Help put a classmate back on the board of directors. 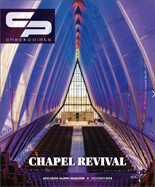 UPDATE: The Air Force announced that the Cadet Chapel will remain open until 17 Jun 2019, when renovation should begin. Expect the chapel to appear approximately as in this original construction photo at the 45th reunion in 2020. 47. Mike & Mary McClendon, Dave & Chris Ehrhart, Bill & Judy Murray, and Jim & Olga Blissit. 48. Bruce & Margaret Edstrom.